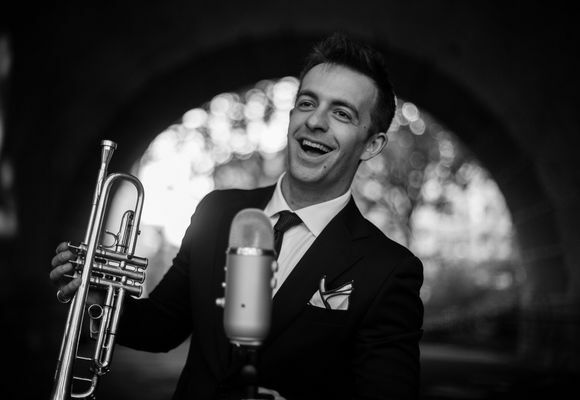 At the age of 26, Pittsburgh-born musician Benny Benack III has been hailed by Nate Chinen of the New York Times as “a charismatic young trumpeter who maintains an earnest sideline as a singer". As a dual-threat, he’s quickly established himself as one of the most versatile and virtuosic voices of his generation. He first made his mark internationally through competitions, winning the Carmine Caruso International Jazz Trumpet Soloist Competition (2011), National Trumpet Competition for Jazz (2010), International Trumpet Guild Jazz Competition (2010), and was most recently a Finalist for the prestigious Thelonius Monk International Jazz Competition (2014). Demonstrating his versatility, he also was a Finalist in two vocal competitions, the Gentlemen Sing Competition (2013) and the Mid-Atlantic Jazz Festival Vocalist Competition (2014). Delivering on the promise of his early career, he has since recorded albums as a sideman for musicians such as Ulysses Owens Jr., Michael Dease, and Chihiro Yamanaka, the latter on the iconic Blue Note Records label. Sought after as a trumpet soloist, he's played in nearly every major big band, including the Christian McBride Big Band, Mingus Big Band, Dizzy Gillespie Alumni All-Stars, Jimmy Heath Big Band, and Bobby Sanabria's Afro-Cuban Jazz Orchestra. An international touring schedule includes frequent engagements in Japan, Mexico, Russia, and most recently, Italy. When not on the road, he calls NYC home, and remains in-demand at the finest jazz venues in town, leading engagements at Jazz @ Lincoln Center’s “Dizzy’s Club Coca-Cola", The Blue Note, Birdland, SMOKE, Small’s, Fat Cat & the Iridium to name a few. He is featured as a vocalist during Jazz @ Lincoln Center’s upcoming 2016 Concert Series in the Appel Room, as a part of “Crooners" celebrating Bing Crosby, Mel Torme & Nat King Cole. He will soon be making his television debut, featured live on-air in the band for NBC's upcoming variety/comedy show "Maya & Martin" in June 2016. As an educator, Benack is highly sought after around the country as a clinician and masterclass presenter, known for his engaging and enthusiastic style with students. Throughout many schools, he leads The Benny Benack Band on behalf of Jazz @ Lincoln Center’s “Jazz For Young People" outreach program, as well as programs at the National Jazz Museum in Harlem, and is currently a Teaching Artist for the NY Pops Education Outreach Program. He is a two-time graduate of the Manhattan School of Music, obtaining his Master of Music degree in (2015). He is endorsed by Torpedo Bag cases, and Carol Brass flugelhorns.